Context: Lifestyle recognition is important because of its ability to prevent diseases and promote the health of the body and mind. Aims: The aim of this study was to determine the lifestyle and its related factors in elderly in Babol health centers. Settings and Design: This study was a descriptive-analytic study that was carried out on the elderly population of Babol health centers in 2018. Materials and Methods: The sample size was 500 elderly people over 60 years of age who were selected by systematic random cluster sampling method and entered the study. The research tools were the demographic questionnaire, the Iranian elderly lifestyle questionnaire. Statistical Analysis Used: Data were Analyzed by SPSS 21 software using descriptive statistics, Pearson's correlation coefficient test, one-way ANOVA, and independent t-test. Results: The findings of this study showed that the mean ± standard deviation score of healthy lifestyle in the elderly was 155.73 ± 16.28. Of included population, 243 (48.6%) indicated moderate lifestyle and 257 persons (51.4%) had a desirable lifestyle. The Chi-squared test showed that men had better lifestyle than women (P < 0.001), also elderly lifestyle was significantly associated with gender,education, income level, marital status, living arrangement, housing status, and age (P < 0.001). Conclusion: Regarding the study results, some demographic factors must be addressed in intervention program, aimed at life style promotion in elderly people. Today, with an increase in life expectancy and a reduction in the fertility rate, the age distribution of the population tends to aging., According to the World Health Organization, by 2050, the world's elderly population will be doubled., Iran, like other countries, is changing the demographic pattern of aging. In Iran, statistical indicators show that the older adults' population has also begun to rise; according to the census of 2016, 7,228,367 people in the population were over 60 years old. It is estimated that this number will reach 10 million in 2021. As the population of older people increases, the risk of chronic diseases and their health problems also increases. Statistics in Iran show that 15% of the patients referred to specialist clinics, 34% outpatient treatment in hospitals and 89% of the beds of institutions and nursing care facilities for people over 65 years old, and in general, 60% of the costs they take medicine to this age group. What is certain is that aging cannot be prevented, and on the other hand, in this period of life, the elders are exposed to many infectious diseases, due to their ages, the weakness of the immune system, and chronic diseases. Most of the common diseases in aging can be prevented by observing a healthy lifestyle. In other word by improving the lifestyle and improving the level of personal health of the elderly, it can prevent illness and help to improve their physical and mental health. A healthy lifestyle is a way of life that provides, maintains, and promotes the health and well-being of the people. On the other hand, a healthy lifestyle is a way of life that reduces the risk of severe illness or early death, helping to enjoy more aspects of our lives. such as a healthy diet, exercise, stress management, social and productive activities, leisure activities, daily activities of life, avoidance of high-risk behaviors (tobacco, alcohol, substance abuse, and unhealthy sexual behaviors), and prevention of accidents. According to special conditions and illnesses of elderly age, to examine the lifestyle in this period, other areas such as visual and auditory problems, balance, urinal and stool control, sexual health, and oral hygiene should also be considered. The elderly's lifestyle is affected by their mental health and can change the pattern of communication or their presence in social activities. Mental health is related to behaviors such as no consumption of cigarette or alcohol, exercise or walking, fresh fruit and vegetables consumption, health status, and blood pressure control. One of the misconceptions about aging is that it's too late to choose such lifestyles in the late years of life; however, it should be noted that choosing a healthy lifestyle and participating actively in self-care at all stages of life is important and it's never too late to take advantage of healthy habits such as quitting smoking, fitness, and exercise and it can be prevented by teaching healthy lifestyle to prevent noncommunicable diseases at old people and prevent life-threatening events and improving the quality of life of the elderly. At the Second Seniority Summit held in Madrid in 2002, it was stipulated that governments should be attention to known risks of unhealthy diet, physical inactivity, and other inappropriate behaviors, such as smoking or excessive drinking of alcohol in health promotion program, health education, and prevention. Healthy aging is the right of all human beings, and it adds to the importance of the phenomenon of aging and the prevention of the problems of this age group. Based on this, awareness of the situation of the elderly, to manage the effective and optimal health of the elderly and improve their health and life, it is necessary to carry out this research. Therefore, the present study aimed to determine elderly lifestyle and its related factors in Babol city. This study was a descriptive-analytic study that was carried out on the elderly population of Babol health centers. The sample size was 500 elderly people over 60 years of age who were selected by systematic random cluster sampling method and entered the study. The sample size calculation is usually 5–20 people per predictor variable. In this study, in addition to lifestyle and general health, there were 13 demographic and medical variables which were included (age, gender, income status, level of education, marital status, location, nutrition status, exercise, stress, sleep, personal and social relationships, underlying diseases, and the number of medications used). Fifteen people were picked for each variable, and the total sample size was 225 people (15 × 15 = 225). Considering the urban and rural community, the number of samples was doubled and 450 was estimated, then the sample size was increased to 500 to cover a 10% sample loss. Sampling was done from April to July 2018. Each center was considered a cluster and in each cluster, taking into account the ratio of the elderly to the total population. The participants were selected according to their electronic records. Then, they were invited to the health centers. The eligible elderly people were entered into the study based on their consent; if unwilling to contribute, and they were replaced with another person. The purpose of the research was described to them, and they were also assured that the results of the study would be confidential. Since most elderly people were illiterate or poorly educated, the researcher used the interview method to complete the questionnaire. The inclusion criteria were age over 60 years old, have no mental and neurological disorders that require medication have no cognitive impairment based on Abbreviated mental test scores 7 and higher (This questionnaire contains ten questions. In this tool, for each correct answer, one point is given. The ideal cut-off point is equal to 7, its sensitivity is 85% and its specificity is 99%, and score of <7/10 is cognitive impairment), and willingness to participate in the study. The exclusion criteria were severe hearing loss, which, with the diagnosis of a specialist physician, led to the use of a psychiatric medicine. The data collection tools were included the demographic questionnaire the Iranian elderly lifestyle questionnaire which were designed and validated by Eshaghi et al. (2010). The Iranian elderly lifestyle questionnaire is a 46-item scale and includes 5 domains, the prevention domain in 16 items; physical activity, sports, recreation, and entertainment in 5 items; healthy nutrition in 13 items; stress management in 5 items; and social and interpersonal relationships in 7 items. The scoring of this questionnaire is done 1–5 by the Likert scale. Then, the total score is categorized into three classes. A score of 42–98, 99–155, and 156–211 is labeled as an undesirable, moderate, and desirable lifestyle, respectively. This questionnaire has been used in various studies to assess healthy lifestyle and elderly health planning.,, Its validity has been confirmed by content validity and its reliability was 0.76 with Cornbrash's coefficient. This study was approved by the Ethics Committee of Mazandaran University of Medical Sciences with code IR.MAZUMS.REC.1397.3573. The data were analyzed using descriptive statistics, Pearson's correlation coefficient test, one-way ANOVA, and independent t-test through SPSS-21 software (IBM Corp. Released 2012. IBM SPSS Statistics for Windows, Version 21.0. Armonk, New York). The findings of this study showed that 282 persons (56.4%) were female and 218 persons (43.6%) were male. The mean ± standard deviation age of males and females were 68.36 ± 6.5 and 68.61 ± 6.7, respectively. Two hundred and thirty-six participants (47.2%) lived with their spouse. Only 88 individuals (5.2%) had university education. The frequency distribution of the older people characteristics has been summarized in [Table 1]. After categorizing the lifestyle score into three levels (undesirable, moderate, and desirable), it was found that 243 people (48.6%) had moderate lifestyle and 257 people (51.4%) had a favorable lifestyle and the mean score of lifestyle in the elderly was 155.73 ± 16.28. Lifestyle with gender had a significant relationship and men had better lifestyle (P < 0.001 and t = 5.18) than women. 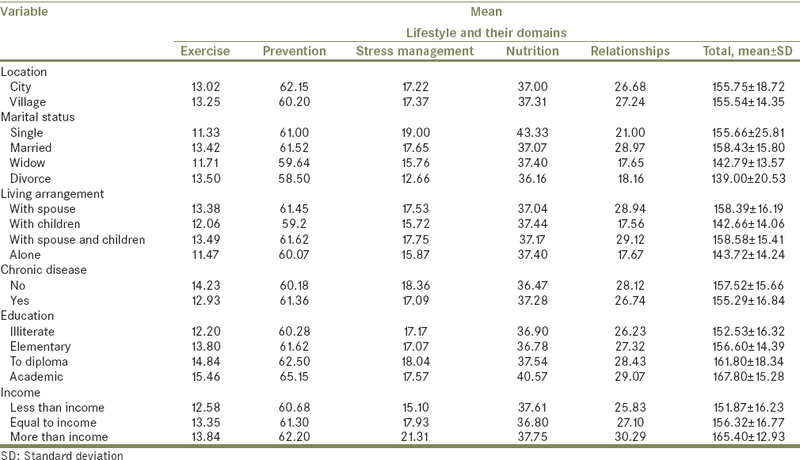 [Table 2] shows the mean score of lifestyle and their domains in both sexes. Pearson's correlation coefficient test showed that age had a significant relationship (P < 0.001) with lifestyle, but there was no significant relationship between body mass index (BMI) (P = 0.965) and lifestyle. As the age increased, the BMI decreased. There was a significant relationship between BMI and chronic disease (P < 0.001). The elderly with chronic disease had higher BMI. [Table 3] shows the correlation coefficient between age and BMI with different lifestyle domains. The results of this study showed that the mean lifestyle score of the elderly living in personal home (156.26 ± 16.27) was higher than the elderly living in rental home (140 ± 19.22). There was a significant relationship between elderly housing status and lifestyle in the elderly referred to health centers in Babol city (P < 0.001). Findings showed that the highest mean score of lifestyle was in the prevention domain (65.15) in the elderly with university education and the lowest was in the field of sports and recreation (12.20) in the illiterate elderly. 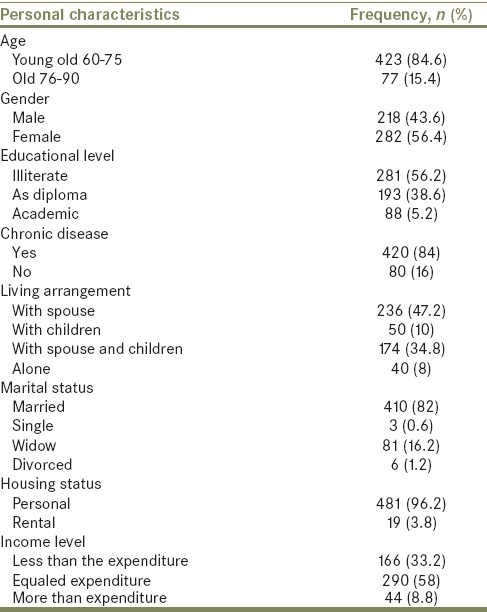 Frequency distribution of mean score of lifestyle according to demographic variables in aged people shows in [Table 4]. There was a significant difference between the lifestyle of elderly people referred to health centers in Babol in terms of marital status (P < 0.001). The married elderly (158.43 ± 15.8) had the highest mean of the lifestyle and the total score of the lifestyle and its dimensions in the elderly who live with the family were higher than the elderly who live alone (P < 0.001). This study shows that there was a significant relationship between lifestyle and income status (P < 0.001), people with higher incomes (165.4 ± 12.93) have better lifestyles. In this study, lifestyle and its related factors in the elderly was examined. Lifestyle of people is affected by various factors. One of the factors that seem to affect the lifestyle is the place of residence because results of this study show that the mean score of lifestyle of elderly people referred to the Babol health centers was at a desirable lifestyle status. In two studies,, there was a favorable lifestyle status in elderly people. While in the other studies,, the average elderly lifestyle was reported to be moderate, and in the one study, the elderly lifestyle has been reported to be low. By the way, it can be predicted that the geographic location of individuals can affect lifestyle. Hence, lifestyle of elderly people referred to Babol health centers did not show any significant difference in their Location. The elderly living in the city had a slightly higher lifestyle than the elderly living in the village. The elderly living in the city had higher scores in prevention, and the elderly living in the village had higher score in interpersonal and social relationships. This can mean that the elderly living in the city are less likely to communicate with people due to their urbanization and living in apartments. In one study, the elderly living in the city had higher scores in exercise and recreation and elderly people living in the village had higher score in interpersonal and social relationships that similar our results. Considering the small size of the village and the existence of large families and the inherent nature of rural life, this can be justified. Furthermore, the overall score in men's lifestyle was significantly higher than that of women. Men had higher scores in exercise and sport, prevention, stress management, and interpersonal and social relationships than in the elderly women. While in the nutritional domain, women had higher scores. This could be because widower's men are alone and as a result can be reluctant to eat , or that because of cultural matter, women are more emphasized about their nutritional status than men. However, in the some studies,,,, men in the domains of sports and recreation, stress, nutrition, and social relations had significantly higher scores and women were more likely to have a higher score in prevention. Age had a significant relationship with lifestyle. With increasing age, the average score in exercise domain decreases. With increasing age by reason of decrease the elderly ability to activity and exercise, this finding is reasonable. Some study , found similar results. However, there was no significant relationship between BMI and lifestyle. While in the other study, there was a significant relationship between lifestyle domains such as prevention and stress management and BMI. Relationship between mean score of lifestyle and chronic disease showed that elderly people with chronic disease had lower score in all domains, except prevention and nutrition. This is justified by the disability of elderly people. Hence, patients feel more well and hopeful in encounter with their disease through improvements in nutritional status. In one study  showed that elderly people had lower scores in all domains except nutrition. The findings showed that the mean score of lifestyle in married elderly was higher than that of the others. Married elderly had higher scores in all domains except stress management and nutritional and elderly people who lived alone and with children, mean score of lifestyle was less than that of others. In some studies,,, mean score of lifestyle in the elderly who live alone was less than others. The present study had a number of limitations – difficulty communicating with the elderly due to high age and their fatigue and lack of cooperation of some participants; moreover, because of the illiteracy of the most elderly people, questionnaires were completed through interviews. Regarding the study results, lifestyle is in relation with some demographic factors (such as age, gender, education, housing status, living arrangement, income and marital status) that must be addressed in intervention program aimed at increasing the lifestyle in elderly people. This study was financially supported by Mazandaran University of Medical Sciences and Student Research Committee. This article was derived from a Master's thesis of Gerontological Nursing, which has been approved at Mazandaran University of Medical Sciences. We would like to express our gratitude to the Student Research Committee of the University for the financial support and to the elders and staff at the health centers in Babol City, Iran, for their cooperation. Khooshemehri G, Kaviani M, Asmari M, Rajabian H, Naserkhaki V. Comparison of quality of life for elderly men and women elderly nursing home resident by Alborz province in 1390. Alborz Univ Med J 2013;2:19-24. Sarrafzadegan N, Gharipour M, Sadeghi M, Khosravi AR, Tavassoli AA. Metabolic syndrome in Iranian elderly. ARYA Atheroscler 2012;7:157-61. Malekafzali H, Baradaran Eftekhari M, Hejazi F, Khojasteh T, Noot RH, Falahat K, et al. The effectiveness of educational intervention in the health promotion in elderly people. Iran J Public Health 2010;39:18-23. Ravanipour M, Salehi S, Taleghani F, Abedi HA. Elderly self-management: A qualitative study. Iran J Nurs Midwifery Res 2010;15:60-5. Iran Sco. Population and Housing Census; 2016. Available from: http://www.amarorgir/english/Census. Black JM, Hawks JH. Medical-surgical Nursing: Clinical Management for Positive Outcomes. Vol. 1. USA: Elsevier Saunders; 2009. p. 481-90. Farzianpour F, Tajvar M. Elderly Hygiene and Overview of the Different Aspects their Lives. Vol. 8. Tehran: BMC Public Health; 2003. p. 65-70. Halter JB, Ouslander JG, Tinetti ME, Studenski S, High K, Asthana S. Hazzard's Geriatric Medicine and Gerontology. 6th ed. New York: McGraw-Hill Companies; 2009. Zanganeh M, Haji Ebrahimi M, Malvandy A. Statistical Yearbook of Golestan Province Health Center 86 Years: Health Center of Golestan Province. 1st ed. Gorgan: Reyhani Publisher; 2008. p. 40-56. Park G, Park K, Shojaei H, Malek Afzali H. Textbook Of Preventive and Social Medicine, General Health Services. 4th ed. Tehran: Samt Press; 2009. p. 231-49. Babak A, Davari S, Aghdak P, Pirhaji O. Assessment of Healthy Lifestyle among Elderly in Isfahan, Iran. J Isfahan Med Sch 2011;29:1064-74. Abedi H, Mostafavidarani F, Riji HM. The elderly perception and views on their health-Facilitating and inhibiting factors in elderly health care in Iran: A qualitative study. Procedia Soc Behav Sci 2010;5:2222-6. Barati M, Fathi Y, Soltanian A, Moini B. Mental health and health promoting behaviors in older people living in Iran, Hamadan. Iran J Nurs Midwifery 2012;20:12-9. Lee TW, Ko IS, Lee KJ. Health promotion behaviors and quality of life among community-dwelling elderly in Korea: A cross-sectional survey. Int J Nurs Stud 2006;43:293-300. Shadpour K. International Plan of Action on Ageing 2002, Based on “Second World Assembly on Ageing, 8-12 April 2002, Madrid, Spain”. Tehran: Iran Ministry of Health and Medical Education with Co-Operation of UNFPA; 2001. Alavian SM. Tutorial for Integrated Care in Elderly, Especially Non-Medical Personal. Tehran: Published by the Ministry of Health Treatment and Medical Education; 2006. p. 6. Hair JF, Black WC, Babin BJ, Anderson RE. Multivariate Data Analysis. 7th ed. London Prentice Hall Upper Saddle River, NJ. 2010. Eshaghi S, Farajzadegan Z, Babak A. Healthy lifestyle assessment questionnaire in elderly: Translation, reliability and validity. Sci Inf Database 2010;9:91-9. Ghanbari Moghadam A, Mohammadi Shahbolaghi F, Dalvandi A, Hoseinzade S. Relationship between lifestyle and general health among elderly people in Tehran Iran J Ageing 2015;10:90-9. Movahedi M, Khamseh F, Ebadi A, Haji Amin Z, Navidian A. Assessment of the lifestyle of the elderly in Tehran. J Health Promot Manage 2016;5:51-9. Najimi A, Moazemi Goudarzi A. Healthy lifestyle of the elderly: A cross-sectional study. J Health Syst Res 2012;8:581-7. Shamsadini Lori A, Pour Mohammadi K, Keshtkaran V, Ahmadi Kashkoli S, Pour Ahmadi M. A survey on the level of the elderly lifestyle in Shiraz. J Health Based Res 2015;1:75-84. Mahmudi G, NiazazariI K, SanatiI T. Evaluation of life style in the elderly. Q J Health Breeze 2013;1:45-50. SamadI S, Bayat A, Taheri M, Joneid B, Rooz-Bahani N. Knowledge, attitude and practice of elderly towards lifestyle during aging. J Qazvin Univ Med Sci 2007;11:83-4. Aliabadi M, Kimiagar S, Ghayoor Mobarhan M, IlityFaizabadi A. Prevalence of malnutrition and factors related to it in the elderly subjects in Khorasan Razavi Province, Iran, 2006. Iran J Nutr Sci Food Technol 2007;2:45-56. Eshaghi S, Babak A, Manzori L, Marasi M. Assessment of nutritional status of elderly people in Isfahan. J Ageing 2007;2:340-4. Ueno M, Ohara S, Inoue M, Tsugane S, Kawaguchi Y. Association between education level and dentition status in Japanese adults: Japan public health center-based oral health study. Community Dent Oral Epidemiol 2012;40:481-7. Hanioka T, Ojima M, Tanaka K, Aoyama H. Association of total tooth loss with smoking, drinking alcohol and nutrition in elderly Japanese: Analysis of national database. Gerodontology 2007;24:87-92.